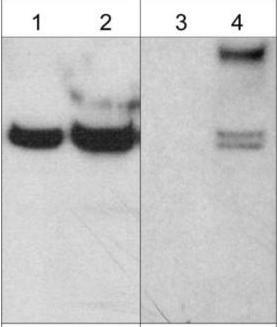 The specific band detected in WB is removed by alkaline phosphatase treatment. Synthetic phosphopeptide coupled to a carrier protein, corresponding to residues surrounding tyrosine 87 of Mouse Ephexin-1 (UniProt ID: Q8CHT1). A431 cell lysate; Mouse C2C12 cells. Our Abpromise guarantee covers the use of ab157594 in the following tested applications. WB 1/1000. Predicted molecular weight: 82 kDa. Acts as a guanine nucleotide exchange factor (GEF) which differentially activates the GTPases RHOA, RAC1 and CDC42. Plays a role in axon guidance regulating ephrin-induced growth cone collapse. Upon activation by ephrin through EPHA4, the GEF activity switches toward RHOA resulting in its activation. Activated RHOA promotes cone retraction at the expense of RAC1-and CDC42-stimulated growth cone extension. Highly expressed in brain specifically in caudate nucleus and to a lower extent in amygdala and hippocampus. Also detected in lung. The DH domain and the PH domain are both required to mediate interaction with EPHA4. Src-dependent phosphorylation at Tyr-179 upon EPHA4 activation increases the guanine exchange factor activity toward RHOA. Cytoplasm. Membrane. Cell projection > growth cone. Associated with membranes. Localizes to axonal growth cones. Immunofluorescent analysis of mouse C2C12 cells labeling Exphexin-1 with ab157593 (C-terminal region) (upper images) or ab157594 (Tyr-87) (lower images) at 1/50 dilution, detected using appropriate secondary antibodies conjugated to Cy3. 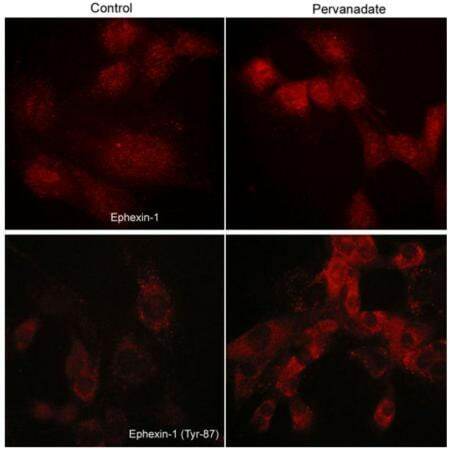 Cells in the right images were treated with pervanadate. with pervanadate (1 mM) for 30 min. ab157594 has not yet been referenced specifically in any publications. Publishing research using ab157594? Please let us know so that we can cite the reference in this datasheet. There are currently no Customer reviews or Questions for ab157594.